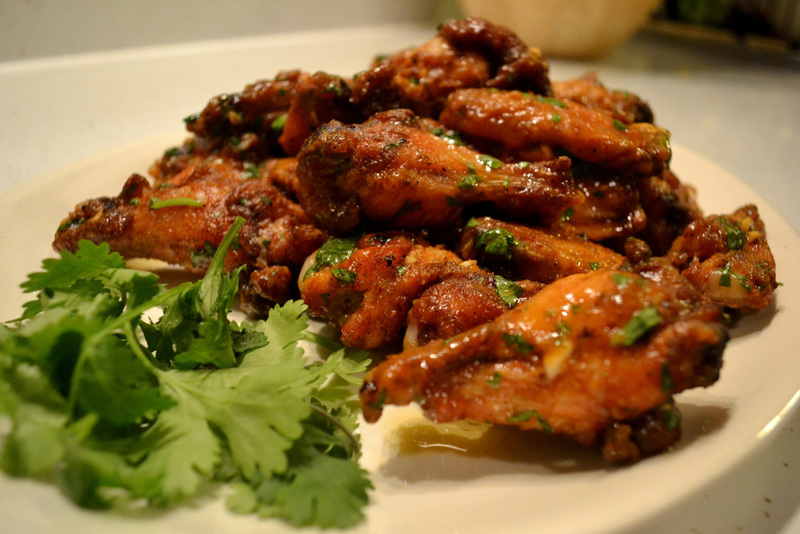 Spicy Crispy Sriracha Garlic Wings. I let the wings marinate in the spice mixture for a couple of hours. I pulled the wings after they cooked for about 30 minutes. The final step was to toss the wings in the spicy Sriracha sauce, which I added 1/2 finely chopped jalapeno to for an extra kick. 2. Preheat drum or kettle grill to 325 degrees. Place wings in a single layer on cooking grate. Cook for about 30 minutes, until wings are firm, but not done. (They’ll finish cooking in the deep-fryer). Remove them from the cooker and place on a platter to dry before frying. 3. In a clean bowl, blend cilantro, minced garlic, lime zest and juice, and melted butter. Add 1/2 cup Sriracha Hot Chili Sauce, combine and set aside. Let rest for at least 10 minutes before saucing the wings so flavors have time to meld.